Steve Milum (left), Special Projects Manager for North Pacific Cannery, with Ken Veldman, Director of Public Affairs for the Prince Rupert Port Authority, place the first plank of the cannery’s Working Dock Restoration Project, to which the Port Authority contributed $200,000 through its Community Investment Fund. 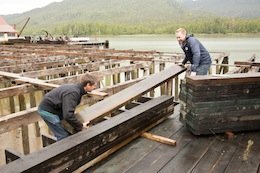 PRINCE RUPERT, BC—A contribution from the Prince Rupert Port Authority’s Community Investment Fund will benefit North Pacific Cannery’s Working Dock Restoration project, part of the historic site’s 125th anniversary conservation program. With the contribution of $200,000, the Port Edward Historical Society will launch a 20,000-square foot restoration of the Working Dock at North Pacific Cannery, the oldest remaining intact salmon cannery on the West Coast of North America. The project is the final piece of an intensive five-year restoration effort with a budget of $2.3 million dedicated to preserving North Pacific Cannery’s 29 heritage buildings and structures. Owned by the District of Port Edward, the 18 hectare site has sustained significant wear and tear since it was constructed in 1889. Extreme weather conditions and age have all contributed to the degradation of 29 buildings and supporting infrastructure, much of which has been repaired or restored through various projects since 2009. Representing the factory operations and employee living quarters of a multi-ethnic workforce, North Pacific Cannery has become an important institution for the preservation and cultivation of the identity and culture of the people of the Skeena and North Coast region. Many members of the local community today are former Cannery workers, descended from cannery workers, or even born in the NPC village. The Port Edward Historical Society has also recognized NPC’s significance on a national and global scale, and has begun the process of having the site designated a UNESCO World Heritage Site.